Looking for some fun little treats to serve your guests at your next family BBQ or a day with friends at the pool? 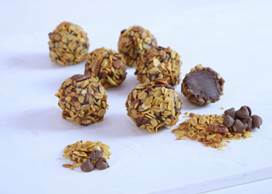 Then look no further than these delicious (and not-too-bad-for-you) recipes for Granola Truffles and Granola Munchkins. These recipes are easy to make, requiring no more than four ingredients, and are sure to be a hit at your next summer soiree! • Place cream and butter into a saucepan. Allow butter to melt on medium heat, stirring the whole time. Raise the heat just until the cream mixture comes to a boil. • Remove saucepan from heat, add the chocolate and stir until it is completely melted. Continue stirring until the mixtures thickens and cools a bit. Cover mixture with cellophane and place in refrigerator. Allow at least 2 hours to cool and thicken for at least 2 hours but mix 3 to 4 times during that time. • To form truffles use a small melon baller or spoon to scoop chocolate mixture into the palm of your hand. 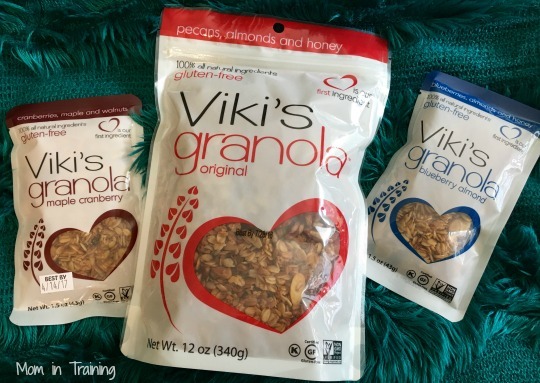 Roll into a ball then roll in your favorite Viki’s Granola. Place completed balls on a parchment-lined tray and refrigerate before serving. 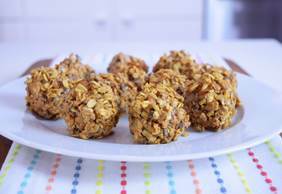 Combine all ingredients in a mixing bowl, chill for 30-40 minutes in the fridge, then roll into balls. Store in an airtight container in the fridge. The munchkins look so delicious! And the truffles... yum!